Coffee Chat is a gathering for non-profit development professionals. Anyone with fundraising duties in their job description-- or an interest in breaking into the field of nonprofit fundraising-- is welcome! Coffee Chat is FREE to attend. 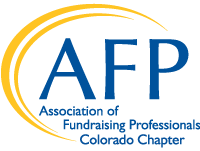 You don’t have to register or be a member of AFP. Plenty of free 2-hour parking is available near Fluid Coffee Bar. Just bring a notebook and a willingness to chat about fundraising and join the discussion!